If you have the time you can make a little piece of heaven anywhere in your yard. If you are short on time or yard, you can still have that heaven. All you need is a container and a few plants. A container (or a group of them) can separate spaces, take care of a problem spot where conditions make it hard to have a bed, or liven up a patio or yard for a special occasion. It’s a way for someone to garden who is not able to enjoy down-on-your-knees gardening. Almost any container can work. There might be an old wheelbarrow you never use, or a big old square-top yellow plastic bucket that soap came in. Punch holes in the bottom, and go all Andy Warhol. Pottery is awful heavy when it’s filled with soil, plants, and of course, water. My own spousal unit does not enjoy a day of hoisting while I stand by in a pretty puzzle trying to decide what looks best where. For that reason you might consider one of the good lightweight containers. Make sure it has drainage holes, and make sure there is somewhere for the water to run so it doesn’t damage your deck or patio. Get a good quality potting soil, and a good quality fertilizer. I would urge you to use organic any time you plant edibles. Organic fertilizer (vs. non-organic) is a good choice if for no other reason than that it’s more fool proof. You are less likely to over fertilize and burn your plants. Don’t use your own soil from a garden bed. It would be dense, and not appropriate for a container. Remember that the only nutrients available for your plants are the ones you put in the pot. You can replenish with fertilizer for a few years, then you must replace the soil. Make sure that all the plants you select have similar light and water needs. A wetland Monkey flower might be happy with a juncus, but it won’t be happy with a plant that likes to dry out real well between waterings. Then learn the designing mantra, “Thrill, fill, and spill.” Try to find a plant for each category. If you want several plants, you can add more than one “fill” or “spill” plant, but you probably won’t want more than one “thrill” plant. “Thrill” doesn’t have to mean bright flowers, either. It might just mean the tallest plant (think leaves with autumn color) or even willow branches with lights strung on them in winter. Arrange your plants so that the “thrill” is at the back if the container will be viewed from only one side or in the center if the container is to be viewed all around. “Fill” goes around the center plant, or in front of the tallest plant of a one-sided arrangement. 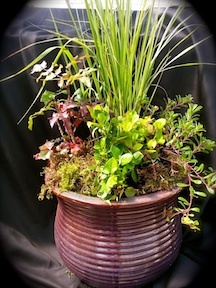 “Spill” goes at the front edge, or all around the pot for a view-all-around container. Choose plants with different colors, textures, leaf shapes and sizes. Before you plant it up, put the plants all together and look at them. Do you like it? Does it “pop” for you? If there are too many airy things, try to find something with a bold leaf. If you have too many bushy plants, try to find one that has a lighter look. If there is just one shade of green, look for a gold-green or blue-green leaf that is complementary. If you can’t find any good blooms, don’t worry about it. Containers don’t have to have flowers; they just have to have variety. Take the first plant out of its container (if it is very stuck, you can squeeze it a bit, or in extreme situations you might even have to hit the side of the container against a table edge) then pull gently from the base of the plant. Sometimes a plant has been in its pot a bit too long, and the roots are tightly swirled. You need to gently pry them apart and get them hanging down. If you can’t, you must cut right through them with a clean, sharp knife or pruners. Place the plants next to each other without undue force, and make sure all the roots are covered with soil, but only to the top of the roots. Water. I have used the evergreen huckleberry as the “thrill” in containers to good effect. It is a slow grower, which means you don’t have to move it for a long time; and it is beautiful year around. A small Mahonia could work, if you don’t mind getting poked, or a baby conifer with a good shape would be lovely for a few years before needing relocation. You might use something deciduous, tree or shrub, for all season interest: buds in spring, flowers in summer, autumn leaf color or berries, the graceful stark beauty of winter in its bare branches. Lights on them for winter nights. If you are putting the container in shade, or even morning sun with afternoon shade, your “thrill” or your “fill” could be one of several ferns. Native and non-native, a fern is an elegant way to add texture to a container. If you want to do something other than the classic geranium route for your “fill” plant, you could go native. Try campanula, iris, or lupine (Lupinus latifolius), which blooms through August. (That could easily be your “thrill”.) Achillea millefolium, (yarrow) has white flowers summer into fall, and a lacy, delicate look. There’s Aquillegia formosa, our native, red columbine; Aster chilensis for the fall, and Aster modestus for now. Penstemon…lots of penstemon. Don’t overlook grasses: hardy, wonderful texture. Grasses work well as the thrill plant, most often in sunny locations, but they can take some shade. For “spill”, think about kinnickinnick, or one of the native strawberries. Fragaria chiloensis won’t give you much color, and you will have to give it a haircut from time to time, but the evergreen leaves are gorgeous, and it will grow for you with very little care. Gaultheria procumbens is another “spill” plant, with pretty variations in color and a good leaf shape. I have seen Cornus canadensis in containers and along with an interesting leaf shape, there are the flower and the berry to look forward to. That’s the multi-season interest you want. If you want more ideas, talk to our staff at the Kruckeberg Botanic Garden. They will have suggestions for your particular situation.